Last week Anthony Watts had a post at WUWT in which he talked about a new effort to find out just how much the urban environment was affecting the temperatures at Californian weather stations. The study is being carried out in conjunction with the EPA, and the announcement came by e-mail rather than a more conventional press release. 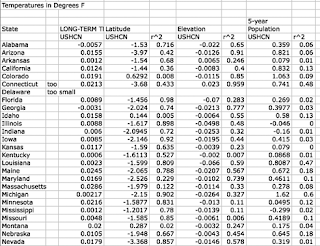 I was interested since, as part of series that I carried out looking at the US Historic Climate Network (USHCN) data, I plotted temperatures for the stations in each state as a function of latitude, longitude, elevation and local population. The first three values were identified with the information at each station. The local population for a town can be found on the web in several different places, and very largely I relied on the city-data web sites for information (see, for e.g. this for Sacremento). The question arose as to which particular temperature should be used for that of the station, since the USHCN provides annual average temperatures, as raw data, Time of Observation (TOBS) corrected and “adjusted.” When the original post for California was written, only the last of these was available, and thus it formed the basis of the analysis. 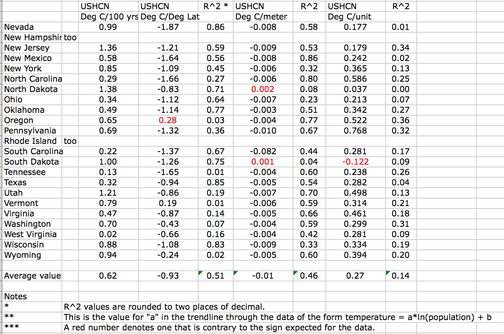 Shortly thereafter, in 2010, the USHCN site also provided the raw data, and the TOBS temperatures for each station, each year. 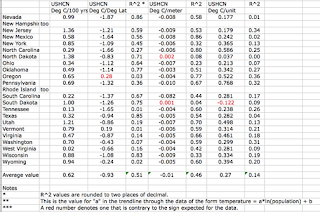 The data was therefore re-analyzed using the TOBS values. 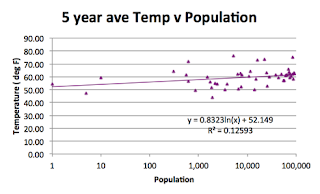 But the plot that was originally generated was plotting the current population against the average temperature since 1895. Figure 1. The comparison of average California station temperature plotted relative to adjacent population, with a log-normal plot. Figure 2. 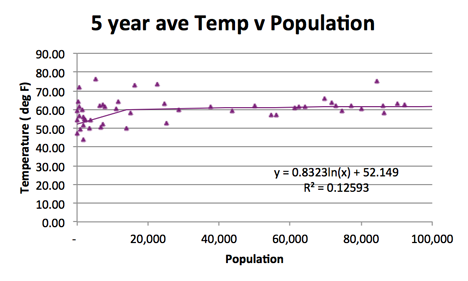 The comparison of average California station temperature plotted relative to adjacent population, with a normal scale on both axes. 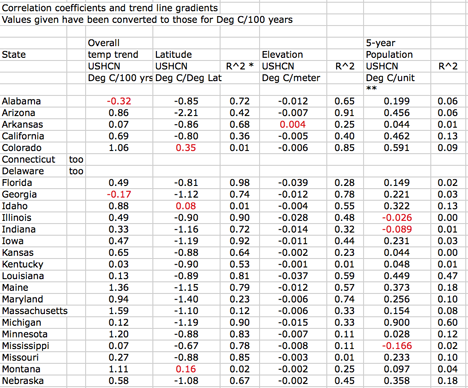 There is a “kick-over” in the rate of temperature rise at around a population of 10,000. (In fact this is a curve and the sharp transition is an artifact of the software, but it illustrates the trend). 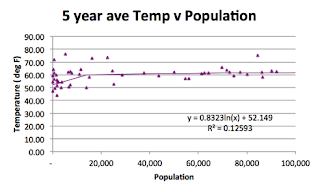 Temperature gains for smaller gains in population are higher below that level, while those above that population require a larger population growth to get the same increase. (Failure to recognize this is one of the underlying faults of the Berkeley Earth Project work on the topic.) 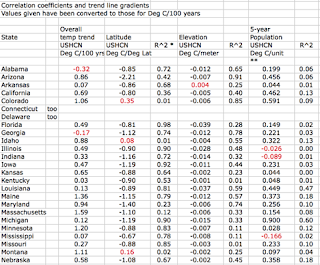 Since the GISS data on temperatures also does not recognize any difference in population size below 10,000 it is also a fault of that data set. I have had to cut the list in two to allow screen capture. Figure 3. 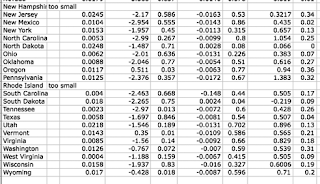 Correlation Coefficients for the relationship of temperature to local conditions with temperatures in degrees C.
And similarly for the table where I have converted the temperatures to def F.
Figure 4. 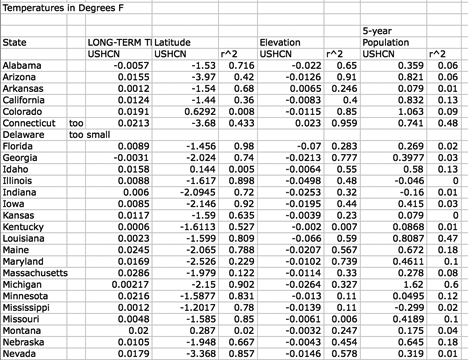 Correlation Coefficients for the relationship of temperature to local conditions with temperatures in degrees F.